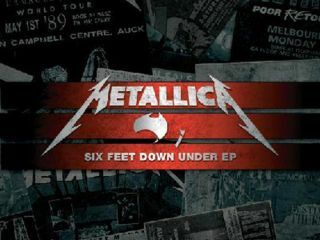 Metallica are celebrating their upcoming Australian and New Zealand tour with the release of The Six Feet Down Under EP, a limited-edition, eight-song set that includes live tracks recorded from the band's previous visits to that part of the world. The EP, which contains songs from as far back as 1989, was announced on Metallica.com. "We're getting psyched up for our return to Australia and New Zealand next week," the group said in a statement on their site. "It's been six long years since we've visited and we're ready to throw down! The nice people at Universal Music were so darn excited that they actually suggested that we release something special to commemorate this last run of World Magnetic tour dates, so...ta-da...we present the Six Feet Down Under limited edition EP! Coming to Trans-Tasman record stores and right here at the Metallica.com Store on September 20. "Here's the story," the statement continued, "the collective brain trust came up with what we thought might be a kinda fun idea...how about some live recordings from each time we have been lucky enough to visit the area? It was all well and good until we realized that we did not start making multi-track recordings of every show until 2004...oops! But you guys, the fans, came to our rescue with some pretty decent bootleg options and we trimmed those down to two songs from each tour in 1989, 1993, 1998, and 2004. "In digging a little deeper, it occurred to us that we had tracks that had never before been released as live b-sides (we're not counting the bonus songs on i-Tunes, okay?) and that that added to the adventure of pulling it all together. Be gentle with us...a few of these songs are, well, we'll say 'rough,' which may be an understatement!! They do, however, capture the live moments and hopefully you'll have as much fun listening as we did playing on those nights."